What kind of organism are you anyway? To be considered a bacteria, the organism first must be unicellular or single celled. Already, this eliminates many organisms from being classified as bacteria. Bacteria are also classified because of the absence of a nucleus and any membrane bound organelles within the cell. Because there is no nucleus to contain the bacteria’s genetic material, the DNA of bacteria is a single loop. Some other structures that are seen within bacteria include cytoplasm, ribosomes, often times a flagellum or cilia, a plasma membrane, a cell wall, sometimes a capsule (thin outer layer), and pili. These organisms can be found everywhere and come in many different shapes, including rod, spherical or even spiral. Other examples: Shigella sonnei, Bacillus cereus, and Clostridium perfringens. The above picture was drawn by me. I looked at the different members from each subsection and composed a tree. These bacteria are regarded as a very diverse group that are usually considered pathogens. These are classified by their metabolic diversity as well as being gram-negative bacteria. Many of these organisms have flagella or use gliding as a way of locomotion. Some of these organisms use photosynthesis as means of obtaining energy. 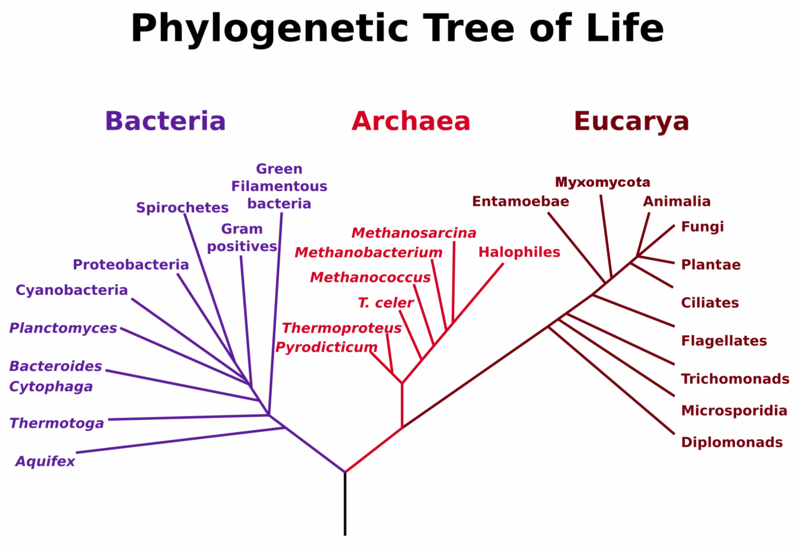 The subgroups of this phylum are classified based on the ribosomal RNA sequences. Other examples of organisms in this phylum: Campylobacter jejuni and Aeromonas hydrophila. Most organisms within this class are of the rod shaped- bacillus. Organisms within this group are either photoautotrophic or heterotrophic. These organisms are also methane oxidizers. 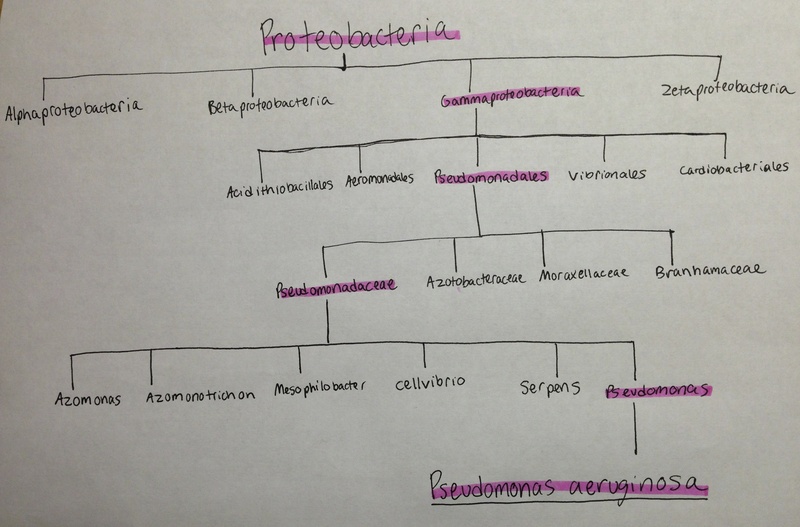 Other gammaproteobacteria include: Plesiomonas shigelloides, Vibrio parahaemolyticus and E. coli. These bacteria are rod shaped and move by polar flagella. Some of these organisms contain pigments that are photosynthetic. They also do not have spores. These bacteria’s environments are commonly soil or water. Sometimes members of this family can be found in plants, making them a pathogen to plants as well. Metabolism of glucose in these bacteria is done by Entner Doudoroff. These bacteria often secrete pyoverdine, which are yellow-green pigments. In addition, they can sometimes be found in a biofilm. Another species of bacteria that also falls under this genus is Pseudomonas syringae. The meaning of this organism can be broken down into parts. The genus name in Latin means 'false unit.' The species name in Latin means 'copper rust.' This term is referring to the pigment coloration that Pseudomonas aeruginosa gives off when it is cultured in a lab setting. This organism is a pathogen, more specifically, an opportunistic one. By being opportunistic, this organism thrives off the breakdown of the host’s immune system, often from some form of infection. Fermentation is never used. Two different types of pigments can be produced, pyoverdin as well as pyocyanin, which is a blue pigment.